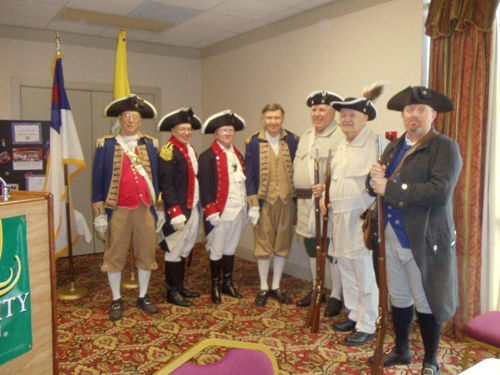 The photo shows members of the MOSSAR Color Guard team at the Eighty-Eighth Annual State Assembly of the National Society Daughters of the American Colonists Missouri State Society. The assembly was held at the Quality Inn, in Columbia, Missouri March 3 - 5, 2011. Major General Robert. L. Grover, Color Guard Commander and MOSSAR Color Guard members presented Colors during the opening procession of this event. The Daughters of the American Colonists has been a relevant presence in Missouri since 1921. The Missouri Daughters support the objectives of the national organization in promoting patriotism, historic preservation and education. Most important, however, is the fellowship and friendships we establish along the way. Those who are already in DAC help to cultivate, nurture, and reap the rewards of the group of women who continue to join us as new members. (Photo)L-R: Major General Robert L. Grover, MOSSAR Color Guard Commander; Brigadier General Russell F. DeVenney, Compatriot Wayne Merrill, Compatriot Jim Boyd, Compatriot Robert Brindell, Compatriot Bill Groth, and Compatriot Jonathan Hunt.